A hell of a day, so much work and planning, this is my last chance for another few weeks and it needs to be today! My contact has told me when he will be there. Weather permitting he should still be there when I finish at the office. He is a professional and I need a professional if my plan is going to stand half a chance of succeeding. The day is long and I try to put the culmination of months of research and construction out of my mind as I go about my daily business. Still, I cannot stop myself from glancing out of the window every fifteen minutes. Wind and rain give way to sun and calm about mid-day. By mid afternoon the trees are waving in the slowly increasing wind. It could be today… it HAS to be today. As my working day draws to a close I text my contact, it’s short and concise. The wind is blowing more than I would have liked but the time has come and it has to be now, it has to be done. Some of my colleagues that have helped me with advice, parts and support had wanted to come along to the main event but an important deadline saw them all stopping back late. It has to be today! I resolve that whatever the outcome, I would re-build and modify to try again when my work mates have more time to come and see the end result. As it happens their absence means the pressure to get a positive result is somewhat diminished. This is a test to see if it can be done and if it can’t then so be it. What am I doing? What have I been building? Well I suppose the title of this blog and the first picture will somewhat give it away. 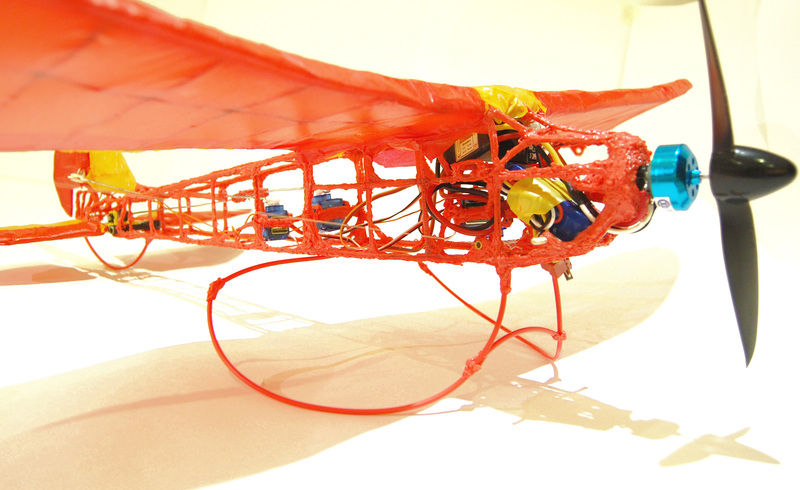 The 3Doodler plane has been some months in the making from its original inception. 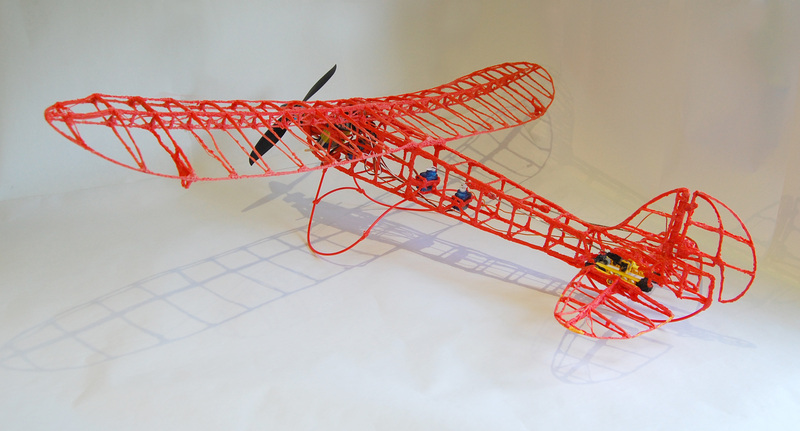 I built the 3Doodler plane from scratch using the 3Doodler pen and some downloaded balsa wood plans from the Internet. 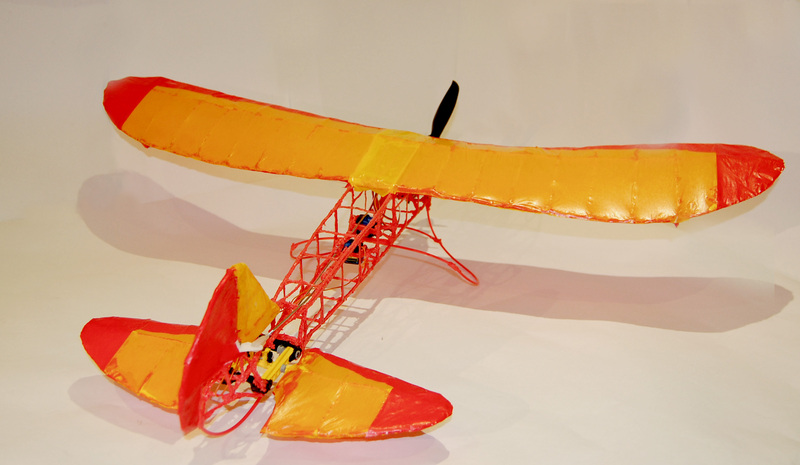 I only dreamed of being able to convert this model into a fully working RC plane. The process happened somewhat organically as I learnt more about radio controls, batteries and electric motors. I originally chose this design as it has special meaning to me from my childhood when my father gave me similar balsa wood plane that I never quite finished but remember with great fondness. Other than that unfinished model from many years ago I have no real experience of building and flying model planes so everything to do with this 3Doodler plane was new to me. 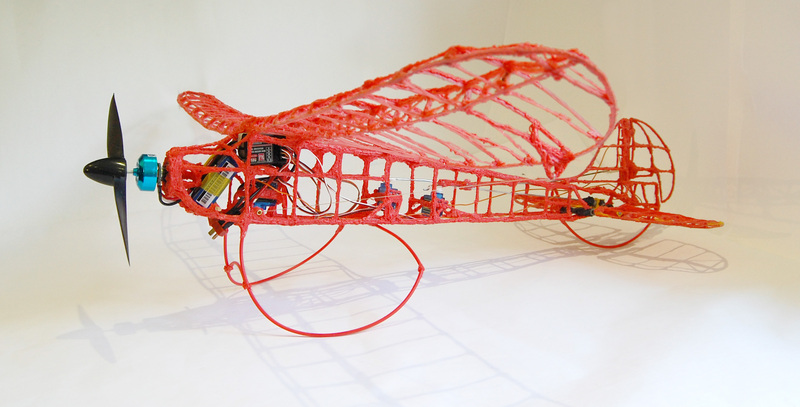 I have blogged about the construction of the 3Doodler plane almost every step of the way. When I have not been blogging about it I have been tweeting about it. @3doodler themselves have been very kind and encouraging in their comments to me and have spurred me on to keep taking that extra step. 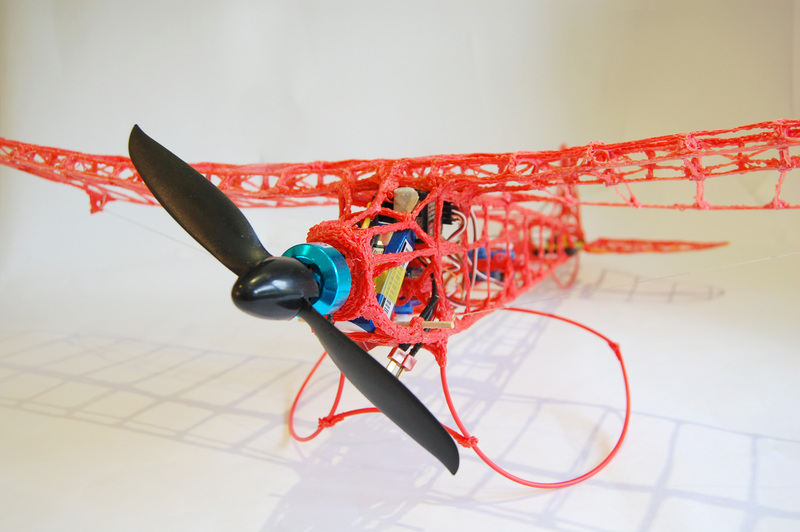 Please see The 3Doodler Plane page for a round up of all my blog posts, construction and testing so far. In my previous posts I had shown the RC controls set up and working. Working so well in fact that I saw fit to try and hover the thing! I immediately knew how foolish this was as the plane hovered away from my grasp and straight into the ground. The repair work was minimal but it did lead me to re build the tail and strengthen the wings somewhat. Take a look at some pictures of the completed plane before I began covering the wings. A friend had donated some large servos from an old plane, they were about 50g each. Since the plane frame was already heavy I found the best way to strip the weight down was to get hold of some micro servos. These are only 9g each, they are also very cheap at about £10 for a set of 4! I guess this means they won’t last long but in the 3Doodler plane they don’t need to. 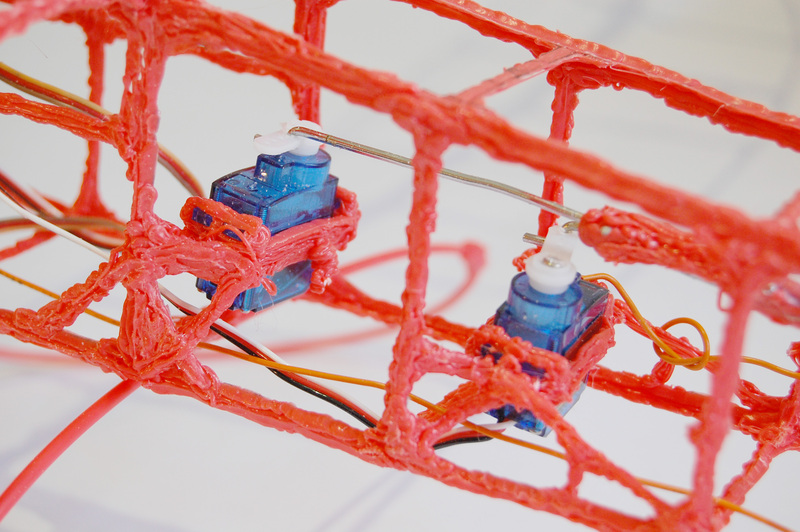 Mounting the servos was an activity I found the 3Doodler excelled at. I simply 3Doodled around the servo casing, being careful not to get the case too hot! Then holding the servo with the rod connected in roughly the right place I simply connected the points and began building up strands like a web until the servo was held securely. I didn’t build any ailerons into the wings, opting instead to deform the wings as a control method. 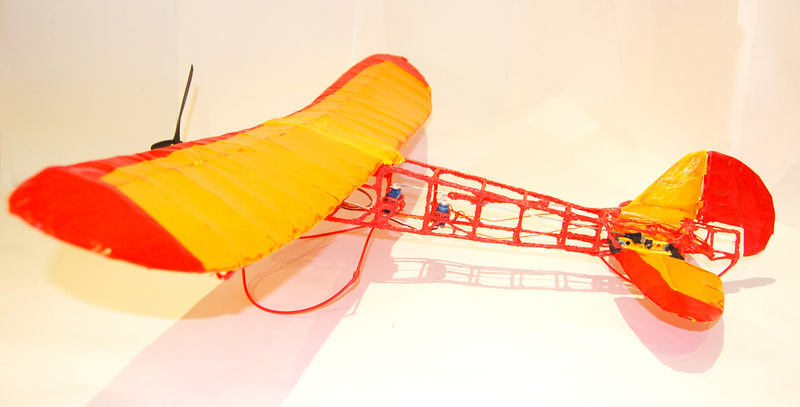 This is done with one servo connected by nylon string to the bottom of each wing tip. For the rudder I built up a 3Doodler hinge, using a kebab skewer to doodle around for all the hinge components and then slid them over a length of 3mm 3Doodler filament as the pin. Then it was just a case of connecting the right part of the hinge to the right part of the rudder. For the elevators I went for a fully adjustable tail wing. To get the strength without the weight of a full 3Doodled mechanism I went for technic Lego pieces, perhaps in a small way this is cheating but I figure that I didn’t 3Doodle the servos so a few bits and pieces here and there would be OK. Especially as Lego and the 3Doodler were almost meant for each other, displaying how the two can be used together I thought a worthwhile experiment. As it happened on my earlier attempt at a hover, it was the Lego part that snapped! For anyone who has not been following my progress I have always tried to include a picture of my 3Doodler Johnny 5, take a look at the build if you’re interested in him. He was one of my first 3Doodles and people seem to like him. Very excited to finish the plane structure and controls, everything is set and working. Time to cover the plane, it will only take a couple of hours I think…. Nope about 4 hours after starting I just about have everything in place, this is why I highly recommend a simpler plane design with nice straight edges. Which is just about as lightweight a material as I could find. Once applied to the plane you can use a heat gun (carefully) to shrink the material tight onto the wing. To get the material to hold in place the manufacturer recommends a special adhesive to apply to balsa wood…. My plane is made from ABS plastic and the contact surfaces are far from smooth. So I did my best to sand the contact surfaces down without damaging the wings and then picked up a pot of PVA glue. This held the material in place well enough for me to cover and then given a day to dry properly before trimming off the excess. It seemed to hold well whilst I used the hot air gun on it to tighten and I was very happy with the result, take a look. Basically the advice is to find a model aircraft club and seek help in learning to fly. The clubs will help you learn in a safe and controlled manner without breaking any laws. Having someone that knows what they are doing help you will also vastly reduce the risk of you smashing you shiny brand new model aircraft into the ground or worse on your first attempt. So I found www.rdmac.org.uk and as it happens they fly from the park 5 minutes away from my work! What a happy coincidence that was. After contacting them trough the website I received multiple replies with great advice and interest in what I was doing. A gentleman named Dave Belcher kindly offered to fly my plane for me and all of a sudden we had a time and a place, only the weather could stop the test flight now! So it has to be today. The weather has to hold. 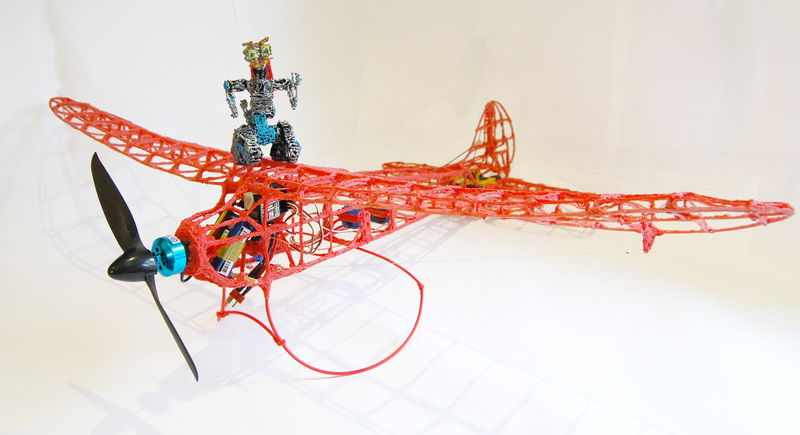 The 3Doodler Plane must take flight! My professional contact is still there and I am on my way. 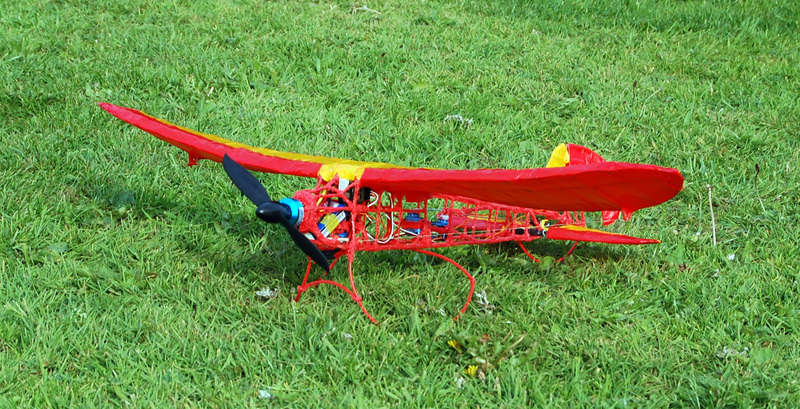 I meet Dave at the field and he was very kind with his analysis of the 3Doodler plane. Some clear issues were highlighted in particular the centre of gravity was too far back which is going to result in a stall. The control method for the deflecting wings was ok but should really pull the wings up instead of down. Well the proposed modifications to give the plane a better chance of flight would require some fairly significant structural changes. So to quote Richard Branson “screw it, lets do it!” if I have to rebuild the plane a bit anyway then I may as well rebuild it after we have tried to fly and most likely crash it. So try we did! Well I have already patched up the structure with the 3Doodler but I plan to make some fairly significant modifications. Possibly re-build the tail end but I might give it another test flight before then. 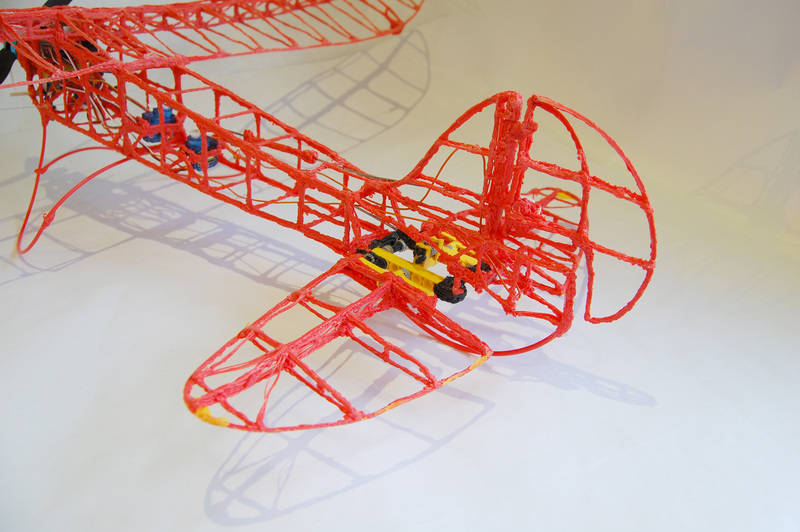 And also special thanks to my wonderfully understanding wife Sarah for having the patience to read through my blog only to realise that I haven’t finished with the 3Doodler plane yet and have more to do. I love you Sarah x. Please Follow @MattBisHere for updates. This is seriously impressive. How long did it take to build? It has taken forever to build..
No mention of wing wash-in during design review? Wing tips have higher angle of attack than wing root, giving the plane nasty stall characteristics. I am also working on more traditional ailerons which should improve the handling a little. 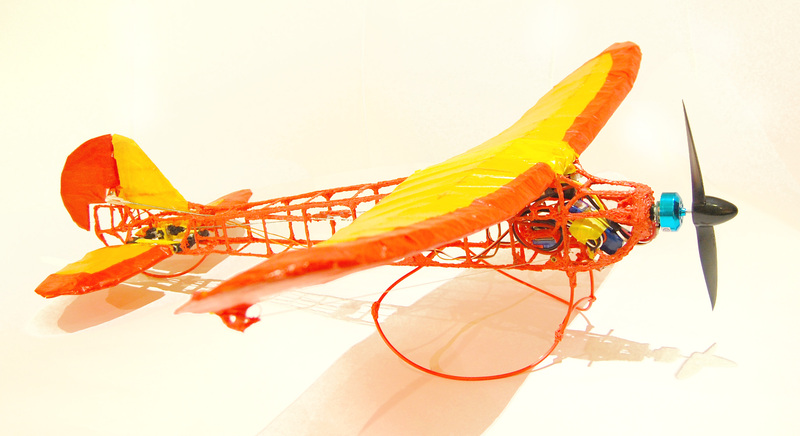 Perhaps I can hand the 3Doodler plane baton over to you, I am not sure I want to build another plane and I have lots more projects I want to work on. Please keep me posted on your progress I would love to see another doodled plane take to the skies and hopefully with a bit more finesse than mine is capable of. 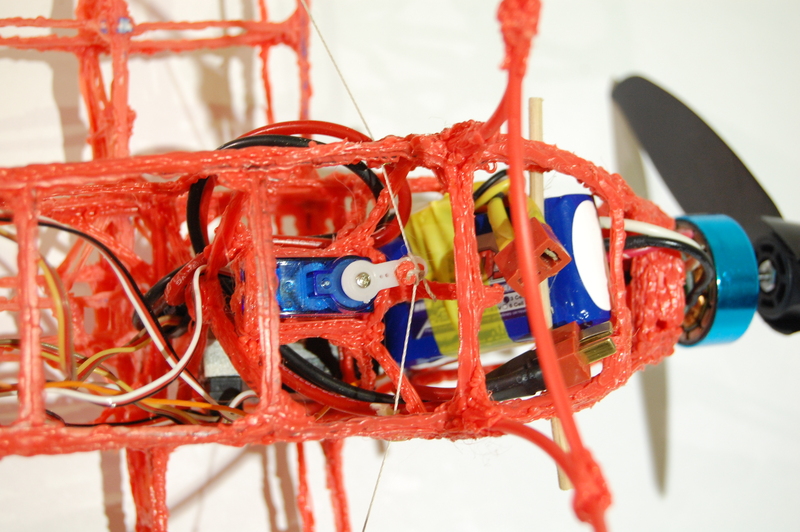 I did not see any other experiments being done with ‘printed’ ABS parts in model aviation and only a few mentions from homebuilt aviation forums. 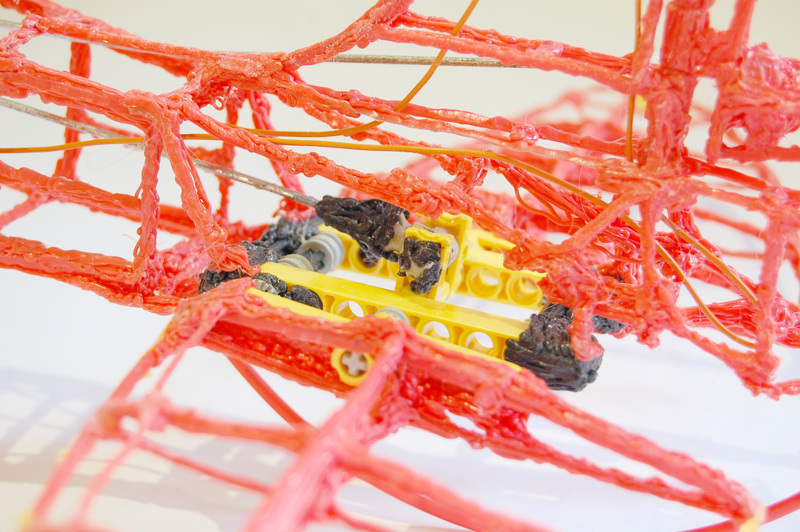 Builders state that ABS works fine for non-structural parts, but not suitable otherwise – no printed ribs yet. I’ll start it small by doodling small, free-flight models and comparing ABS VS balsa wood ribs. Balsa is light and strong when stressed in its grain direction, but tricky to work with in some circumstances. ABS mechanical properties are unknown to me yet. I’ve seen lots of art & craft projects done with it, but nothing technical (except yours!). I believe I can make precise and constant airfoil sections by pouring melted plastic in a 2D rib mold. The resulting rib would look very much like an I-beam, trussed rib found in real aircrafts. Spars, leading & trailing edges will be made of traditional materials or carbon fibers, if needed. But first, I’ll get familiar with that big plastic-spewing cigar, and print some paper cilps and bookmarks. I already imagine one shaped like the now famous “Simon’s Cat”, which I’m very found of… and blog about all of this. Pingback: 3D дома развиваются | Blogsiam | Внутренний Сиам.